Practice Area: Driving range with grass tees, putting green, chipping green and practice bunker. Description: This is an older course, originally built in 1948 to service the mill workers. It has a nice clubhouse and friendly membership plans. The course has a more classic layout than today's tracks and is very walkable. 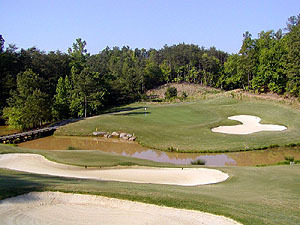 The front 9 holes were designed by Donald Ross, with George Cobb finishing the course's last 9 holes. 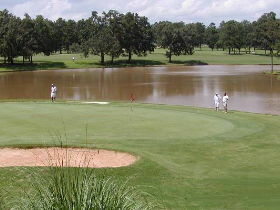 The course was renovated under the direction of Clyde Johnston in 2008. It is located right in the heart of Fort Mill. This course is a very junior-friendly place and you'll likely see alot of father-son pairs. B-Man's Take: I've only played here a few times, but I like the classic layout. The greens are now MiniVerde Ultradwarf Bermuda and are well-kept and cut to be fast. The par 3's are all hefty from the white/member's tees at 154+. There are several holes with water in play and every hole is well-bunkered. My favorite hole is probably #16 because of the picturesque, severely downhill approach shot into this par 5. My least favorite would probably be #12, another par 5, but this one with a tee shot over a pond and an uphill approach. The course is pretty straightforward with very few blind shots or doglegs and the classic layout with holes running side-by-side can be forgiving. With a friendly staff, the walkability, and a nice 19th hole restaurant bar, this is a nice member club that's open for public play.